Planning a project is something that business owners and managers often dread. The Project Timeline Organizer Sheet is a way to plan a project worry-free. The simple template was designed to break apart your project into small and easy to manage pieces, giving you more time to focus on effective strategies and the leadership aspect of your project overall. The structure of the template is also easy to understand and edit. You will find a simple timeline and places to enter the individual tasks of your project on that timeline. Get started planning the perfect project today by downloading the Project Timeline below. Once you have the template file downloaded and opened on your computer, begin by entering your business or company name at the top of the page. To change or edit any of the pre-written information, simply click a cell and write something new. The old information will be immediately overwritten. You will then need to lay out your timeline, corresponding to the start and finish dates of your project and the goals you have for important tasks. Go through the timeline and change the dates and month that are listed as an example. The next step is to break apart your project into workable tasks and enter those onto the lines provides for you. Keep in mind, you can easily move these lines to the dates you want them completed simply by clicking and dragging them over. Using the bars at the bottom of this page, you can also include tasks that need to be performed over a certain length of time as well. 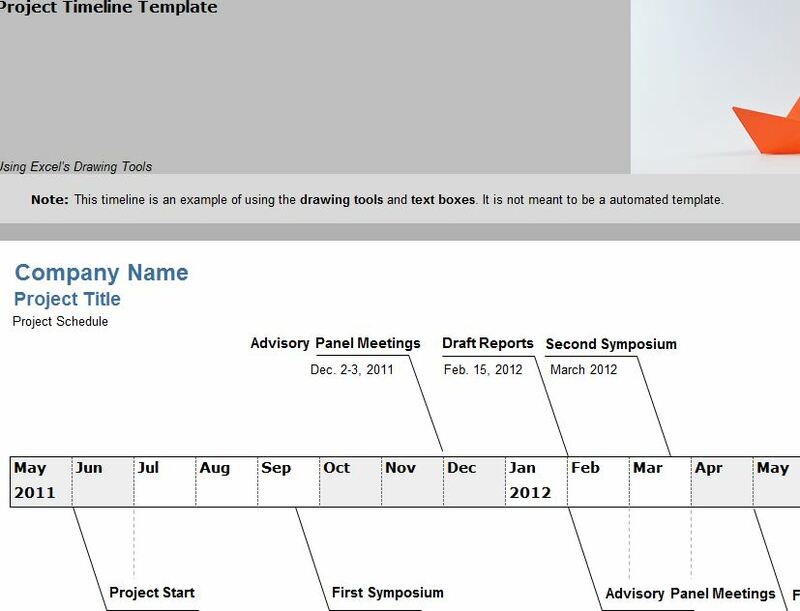 By using the Project Timeline, you will carefully organize your project in a way that’s fluid and easy to follow. No more projects will fall through the cracks on your watch, start optimizing your time with this free template.